This is the best full-size pickup truck for you if you’re a Toyota loyalist or someone who is open to considering a rig that doesn’t carry the label from a US-based automaker. Tundra went on sale for the 2000 model year and was the first “true” full-size pickup to be built by a Japanese company for sale in North America. Its predecessor, the T100, was closer in size to Toyota’s midsize Tacoma. The second-generation Tundra, which debuted for model-year 2007, was the company’s most focused effort to build a pickup that could run with the likes of the Chevrolet Silverado 1500, F-150, and Ram 1500. On paper, it had the numbers to do it, including a burly new V-8 engine that was one of the most powerful in the class. Officials hoped to move 250,000 Tundras annually from the moment the new truck rolled off the assembly line at Toyota’s state-of-the-art factory in San Antonio, Texas. Regrettably, it never met those expectations, with inaugural model year sales falling more than 50,000 units short of that goal. The global recession in 2008-2009 saw sales sink to less than 80,000. 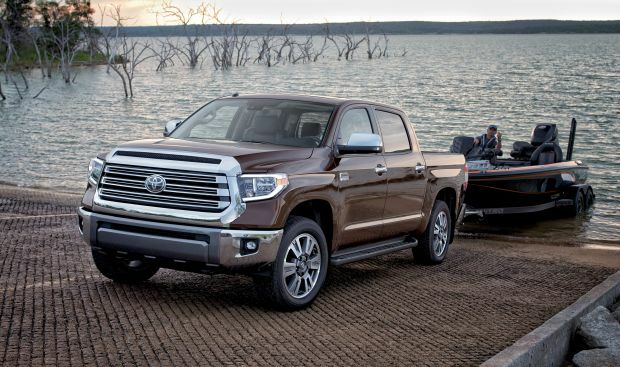 Despite a significant refresh for the 2014 model year, Tundra hasn’t fully recovered, hovering around the 115,000-120,000 mark since that time. For comparison, Ford sold more than 73,000 of its F-Series trucks in April 2018 alone. Off-road enthusiasts might want to wait as model-year 2019 will see the launch of an updated Tundra TRD Pro edition. Consider it Toyota’s answer to Ford’s extremely popular F-150 Raptor. The TRD Pro has a raised off-road suspension, LED illumination for the headlights, fog lights, and exterior accent lights, forged aluminum wheels, heavy-duty underbody skid plates, and a unique grille, exhaust system, and interior trim. Other Tundra intenders should look at the 2018. It receives mildly updated exterior styling, a suite of standard driver-assistance features, and a new “street truck” inspired TRD Sport Package. The grade structure consists of the base SR, volume-selling SR5, and upscale Limited. There are two flagship trim levels with similar equipment levels but different themes. The Platinum gives off an urban vibe with its brushed-metal-style trim and black perforated leather upholstery. The 1794 Edition employs a Western theme with a chrome billet-style grille and brown leather seating surfaces with white contrast stitching. The name 1794 signifies the founding year of the JLC Ranch, where the Tundra’s assembly plant now resides. For 2018, Toyota has dropped the two-door regular cab body style. SR, SR5, and Limited models are available as the extended Double Cab with the choice of 6.5- or 8.1-foot bed. All but the SR offer the crew cab CrewMax with four full-size doors and a 5.5-foot bed. Rear-wheel drive is standard. Part-time four-wheel drive (4WD) is optional; it includes low-range gearing for off-road use, but the system should not be left engaged on dry pavement. Styling: Pickup truck styling tends to age better than that of passenger cars and SUVs, and Tundra is no exception. Despite launching for 2007 and being updated for 2014, this rig remains handsome. Additional tweaks for 2018 include a revised grille for the SR, SR5, and Limited. The Platinum and 1794 Edition look appropriately high end, though neither is as opulent as flagship rivals such as the Ford F-150 Limited, GMC Sierra Denali, or Ram 1500 Laramie Limited. 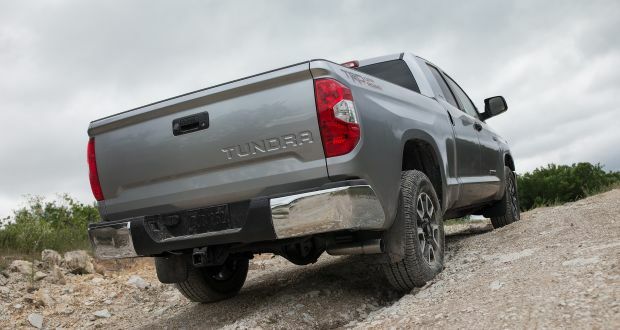 Tundra lacks some conveniences of its competitors, such as steps to ease access to the bed or integrated exterior storage boxes. The cabin is highly functional but getting into it can be difficult because the truck is very tall. Running boards are a factory option on the Limited and above, but they are available on other models as dealer-installed accessories. We would strongly recommend them. Its model-year 2014 freshening brought a revised dashboard design with controls laid out in a more logical manner than in the 2007-2013 version. The instruments are clear, albeit not quite as comprehensive as what you can get on the F-150 or Ram. All grades include a version of Toyota’s proprietary Entune infotainment system. It works fine, and frequent software updates improve responsiveness. Still, the interface looks dated when compared with Chevrolet’s MyLink, Ford’s Sync, or Chrysler’s Uconnect, and Toyota does not offer support for Apple CarPlay or Google Android Auto. On the latter point, rumor has it the company is going to address this deficiency starting in model-year 2019. The standard cloth upholstery looks and feels durable. The cushion is quite firm, and limited seat adjustment might result in slightly sore backsides on extended drives. The leather surfaces on the Limited and above are more supple. Legroom is great up front regardless of body style. The DoubleCab’s legroom is no better than that of a compact car; the CrewMax is limousine-spacious. Models with the standard bench seat can seat up to six. The center portion up front can be folded to create an armrest with cupholders and a slot to put your phone. There’s no padding, however, so it becomes uncomfortable after a while. The bucket seats included on most grades have a properly padded armrest and a roomy center console. Mechanical: Tundra’s engine lineup is all V-8, all the time. Most SR and SR5 grades use a 4.6-liter unit with 310 horsepower and 327 pound-feet of torque. Available on these models and standard otherwise is a 5.7-liter engine with 381 horsepower and 401 pound-feet of torque. Both engines pair exclusively with a 6-speed automatic transmission. The 4.6-liter V-8 provides unexceptional response across the board. The 5.7 is far more robust, though it’s no quicker than the large V-8 and turbocharged V-6 engines found in rivals. Toyota’s decision to stick with a 6-speed transmission is out of step with more modern full-size trucks that are offering 7-, 8-, and even 10-speed boxes. Tundra’s handling is about as un-engaging as you can get. Steering response is slow and almost completely devoid of road feel. Uneven roads and corners trigger lots of play in the steering wheel. The ride is very bumpy, especially with an empty bed. At least the cabin is reasonably quiet at cruising speeds. Overall, the driving experience feels like you’re piloting a full-size truck from 10 years ago, which is not surprising given that’s essentially what the current-generation Tundra is. 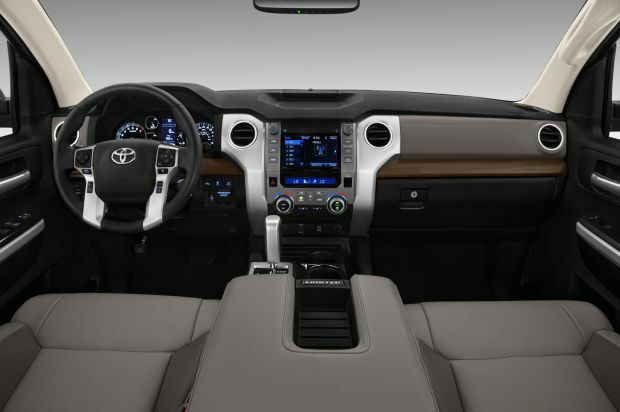 Features: Newly standard on all 2018 Tundra models is Toyota Safety Sense P (TSS-P), a suite of driver assistance features that includes autonomous emergency braking with pedestrian detection, lane-departure warning with automatic steering correction to keep you in your lane, automatic high-beam headlights, and adaptive radar cruise control. The SR grade is Toyota’s equivalent of a work truck. It’s basic but includes power windows and locks, a dampened rear tailgate, rearview camera, and Entune infotainment with a 6.1-inch touchscreen display. The SR5 adds fog lights, upgraded exterior trim, HD and satellite radio receivers, and 7-inch infotainment screen with support for GPS mapping via a connected smartphone and dedicated app. Limited grades add the 5.7-liter V-8, 20-inch wheels, LED headlights and foglights, leather upholstery, heated and power-adjustable front seats, dual-zone automatic climate control, imbedded GPS navigation, and Toyota’s JBL-branded audio system. The Platinum and 1794 Edition add their own specific exterior and interior styling cues, blind-spot alert with rear cross-traffic detection, and ventilated front seats. 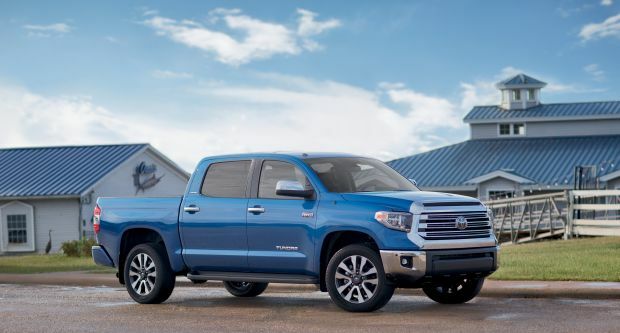 Tundra starting prices fall in-line with comparably equipped rivals. They’re not quite as lavish as models such as the F-150 Limited or Sierra Denali, but the Platinum and 1794 Edition cost thousands less even with the substantial incentives offered by the Detroit-based manufacturers. Note that base prices listed here include a $1,295 destination fee. Among models with rear-wheel drive and depending on bed/cab configuration, the SR grade spans $32,415-$34,015, the SR5 $34,125-$37,815, and the Limited $41,680-$43,545. The Platinum and 1794 Edition are CrewMax only and have the same starting price of $48,375. The cost of 4WD depends on which model you select. SR versions range from $35,465-$37,065, the SR5 $37,175-$40,865, and the Limited $44,730-$46,595. The Platinum and 1794 Edition start at $51,425. Most options come in packages that must be bundled with other features. The SR’s only one is a $275 credit to remove the power windows and locks and replaces the standard cloth upholstery with vinyl. The SR5 offers 15 packages ranging in price from $1,220-$6,080. The SR5 Upgrade Package is the foundation. It replaces the front bench seats with buckets and adds a tilt and telescopic steering column, and wireless garage-door transmitter. You can add heated exterior mirrors, 18-inch aluminum wheels, and imbedded navigation. The available Convenience Package adds front- and rear-obstacle detection and blind-spot alert with rear cross-traffic detection. The TRD Off-Road Package includes unique wheels, underbody skid plates, and specific suspension tuning. New for 2018 is the TRD Sport Package that has 20-inch wheels, sport suspension, LED headlights and fog lights, and unique badging. The TRD Off-Road Package is also offered on the Limited in bundles that cost anywhere from $70-$1,135. The $1,065 Limited Premium Package adds obstacle detection, blind spot/rear cross-traffic alert, and imbedded navigation. Ordering the Premium Package allows you to add running boards for an additional $345. Running boards are also available on the Platinum and 1794 Edition for $345 and $455, respectively. The latter includes chrome wheels that can be ordered by themselves for $110. A power sunroof is $850 on both. At $47,150, a 4WD Limited CrewMax with Premium Package is our pick for best value. A 4WD SR5 Double Cab with the 6.5-foot bed and Upgrade Package is also a compelling buy with a sticker price of less than $39,000. This area is arguably the Tundra’s most significant drawback. All models have EPA-estimated fuel-economy ratings that are at the bottom of the competitive set. With rear-wheel drive, models with the 4.6-liter V-8 rate just 15/19/16 mpg city/highway/combined. The 5.7-liter engine rates just 13/18/15 mpg. Adding 4WD drops ratings further still to 14/18/16 mpg with the 4.6-liter V-8 and 13/17/15 with the 5.7. Our 4WD SR5 DoubleCab with the 5.7-liter engine returned 15.5 mpg in our suburban test loop. All models use regular-grade 87-octane fuel. Certain versions of the 5.7-liter engine can also run on E85 Ethanol-blended fuel. Despite basic engineering that is more than a decade old, Tundra at least remains competitive in the segment. Still, this truck is in desperate need of a clean-sheet redesign. Silverado, Sierra, and Ram are all new for model-year 2019, F-150 received a major freshening for 2018, and Nissan redesigned the Titan for 2017. Toyota officials have indicated that a new Tundra is a “priority” for them, which would indicate that a next-generation model is in development. When it might see the light of day is another matter entirely. The launch of the new TRD Pro indicates that the current model will carry on through at least 2019. We wouldn’t expect any major announcements on this front until the 2019 Los Angeles Auto Show, if not later.